Surprise your loved ones with this Women's Pride Avon Floral Floral Cluster Drama Necklace and stay forever in their hearts. 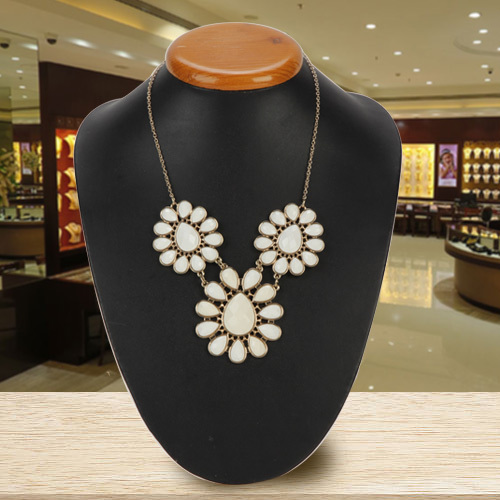 Meant for young ladies, this fabulous Necklace is made of White Acrylic Stones and paired with a sleek Chain. Flowers Delivery Raipur, Send sweets Panchkula, Wedding Cake Tenkasi, Diwali Mithai Rajamundry, Send Flowers and Gifts to New Delhi, Online Shop Faridabad, Flower to Calcutta, New Year Flowers Vellore , Fresh Fruits Taran Taran, Send Gift Gopi, Dry Fruits to Jammu, Birthday Delivery Coimbatore, Sending to Belgaum, Flower shop Madhyamgram, Sambhalpur Online Cake Delivery.